If so many people crave a happy partnered relationship, why do so many struggle to maintain the relationship for a lifetime? According to Dr. Anne Brennan Malec in her book Marriage in Modern Life, “When infatuation inevitably diminishes and real life intrudes, your partner must remain a priority, or you will eventually run into trouble.” A relationship will not always be so effortless; this is often a false impression most partners make. Most relationship success is based on joint commitment and relationship skills or lack thereof. As a systemic marriage counseling, couple, and family therapist, I often see clients during therapy sessions who, like Dr. Malec, get through their relationships by examples they have seen in their family of origin (parents, siblings, etc.) or by trial and error. Sometimes these role models or examples are toxic and that, lucky for you, does not mean your relationship is doomed to also fail. Making a relationship work is a conscious daily choice, and should be done without the prompting of a counselor during therapy sessions. You and your partner control your relationship’s destiny. Maintaining a healthy relationship is like a car. You wouldn’t buy a new car and wait years to get an oil change, would you? Relationships do not thrive because of luck but because partners take actions that make their relationship a priority, whether that is marriage counseling or something else. Even if you and your partner are struggling now, the good news is the behaviors and skills you need to turn things around can be learned. According to Dr. Malec, “Try not to think of it as work but rather a necessary nurturing of your most valuable asset.” It is never too late to teach a dog new tricks. With the help of Dr. Malec’s book, combined with couple’s or marriage counseling therapy, you can incorporate suggested changes into your marriage and will then be on a healthier path to a more connected and rewarding relationship. Divorced couples report the following reasons for the failure of their marriages: unmet emotional needs, lifestyle differences, boredom, infidelity, incompatibility, drinking or drug use, poor communication skills, dissatisfaction with handling of joint financial issues, high levels of conflict or anger management, and age at the time of marriage. 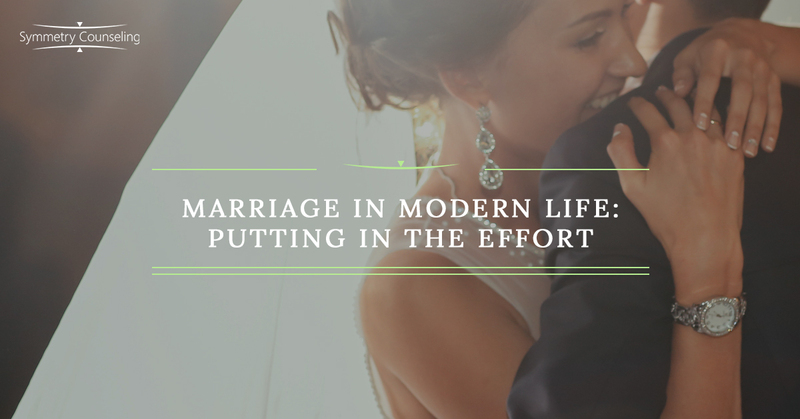 Many poor relationship habits stem from the false belief that marriage should not require work. A relationship, like everything we value, is not self-sustaining;, it requires frequent attention and effort before reaching the point of marriage counseling or help from a therapist. Think of an intimate relationship as a living, breathing organism that requires nurturing, feeding, and care. Take our cell phones, laptops, and tablets as a prime example. Technology competes with and often wins our attention away from our partners, family, and friends. Technology provides sufficient stimulation with little to no effort on our part. A new love interest usually fulfills all needs for diversion and novelty but, as we begin to feel more and more comfortable, we take our partners for granted. Your partner likes feeling like they are at the center of your universe and most likely will not enjoy feeling that they have fallen off the pedestal when technology wins. In most healthy relationships, infatuation matures to a deeper level of attachment where you have reliability, trust, and consistency. You learn to know without conscious thought that your partner has your best interests in mind, just as you have theirs. When a deeper connection develops Dr. Malec says, “That is your call to action to maintain those physical and emotional intimacies that help your relationship thrive.” You need to continue purposefully to care and to nurture each other without prompting from a therapist during marriage counseling sessions. The greater focus you put toward creating a solid marital bond built from mutual support and respect, healthy and frequent communication, and steady and frequent expressions of affection, the stronger foundation you have to handle life’s ups and downs, including the transition to parenthood. Marriage is not just a ceremony or event; it is a long-term commitment that needs your attention and investment, just like your car requires gas. Do not expect your relationship to run indefinitely on fumes. Contact Symmetry Counseling today to schedule a relationship or marriage counseling session to further discuss your relationship concerns and learn ways to strengthen your relationship or marriage.